Perfect for breakfast of a dessert – especially in winter. The batter in “SA People Tasty Recipes” is a very easy and tasty basis for a more elaborate pumpkin fritter recipe. Beat the mashed pumpkin and egg together. Add the rest of the ingredients and beat well. Heat oil in a saucepan and drop spoonsful of the batter into the oil to fry. As soon as the fritters start making bubbles, turn them over and fry on the other side for a minute or two until golden brown. Mix the sugar and cinnamon to make cinnamon sugar. Sprinkle spoonsful of the sugar on the pumpkin fritters while still hot. Heat the brown sugar and butter in a saucepan until the sugar is melted. Lower the heat and add the cream, cinnamon and chocolate. Stir continuously until the sauce starts to thicken. It will take approximately five to eight minutes for the sauce to reduce to half the volume. 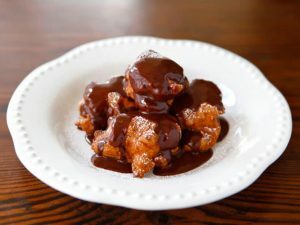 Serve the pumpkin fritters with ice-cream and warm chocolate sauce.